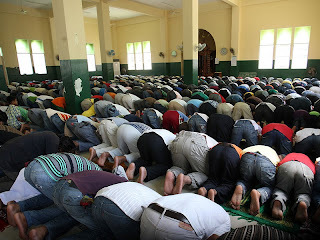 Ramadan in the Philippines began at the rise of the sun today. As of the moment and until 29 days later, each day from sun up till sun down, will be a day of denial of worldly pleasures. Such like food, water, alcohol and other things are avoided during daylight by the Islamic community as part of the practice of their religion. Fasting is one of the Five Pillars of Islam. Just like any other religion, fasting is important but none prescribe and implement widespread practice of such like Islam. Fasting is a way to train oneself to be in control of mind and body, pushing it to the limits. One of the virtues fasting impart is discipline. To become master of self, one must know the effect of physical urges to know how to deal with them. That is where discipline comes. Being disciplined doesn't mean being rigid and hard, but having that focus on knowing what is good and avoiding what could harm. This is the reason why most Muslims are fierce and great warriors, they know how to discipline themselves and focus on their goal. They fear no pain because they are masters of their own bodies. They keep coming even after being shot many times during the Philippine-American war because they have focus and are not afraid to die. Well, also because if one dies in Jihad, one becomes a martyr and the rewards in heaven are "to die for."